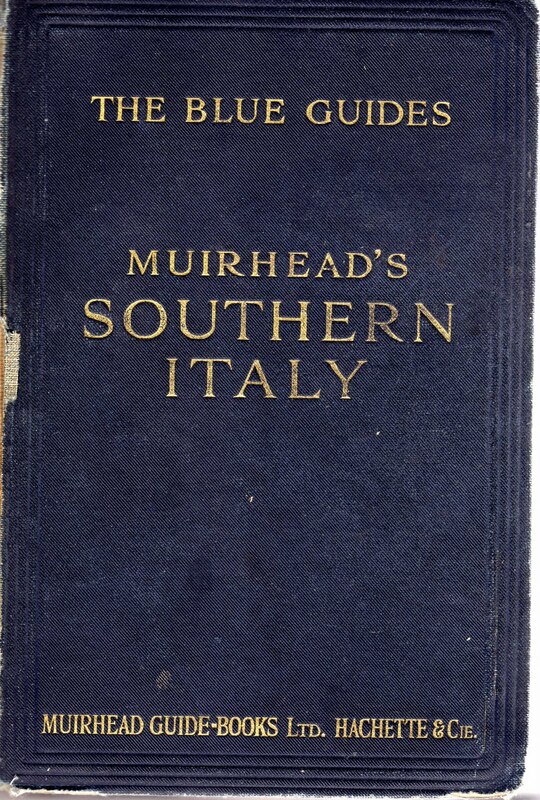 The above bookseller label is affixed to the bottom of the inside back cover of an extremely tattered1 1925 copy of The Blue Guides' "Muirhead's Southern Italy." The yellow label is one inch wide and three-eighths of an inch deep. 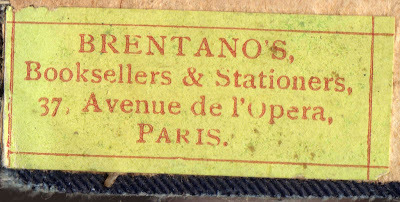 Brentano's had multiple American locations and a bookstore that was located on the famous Avenue de l'Opéra in Paris for more than 100 years. The first Brentano's opened in New York City in 1853. The Paris location opened in 1895. 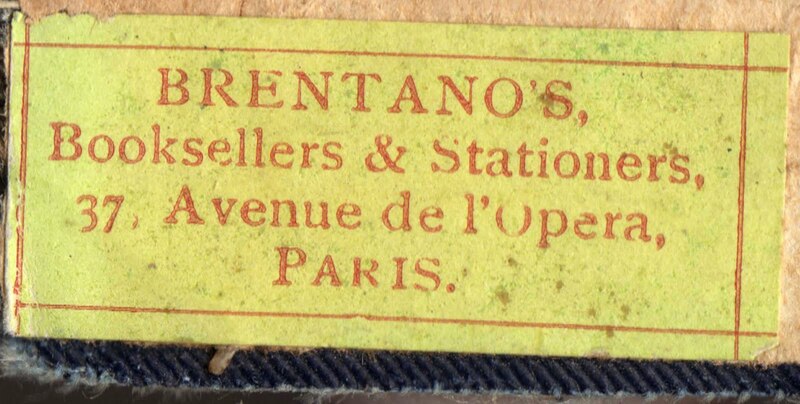 According to Wikipedia: "From its headquarters at 586 Fifth Avenue [in New York City], Brentano's became a publisher, with a specialization in French literature that led it to publish under the imprint 'Éditions Brentano's' many titles by French writers in exile during the Vichy France period." It is with sadness, and astonishment - despite the prolonged agony of these last months - that we inform you of the official closing of Brentano's Bookstore - Paris, Monday, June 15, 2009. We who remained for the final voyage are a skeleton crew. Along with the many cherished former colleagues you have known, we thank you for your vital collaboration and consideration throughout the years. It has been our privilege to be a part of the special world of books and bookselling and a bridge between cultures. After 114 years at the same address Brentano's - the American Bookstore in Paris, will no longer welcome the curious passer-by and the faithful regular. In these final days many, many customers have expressed sincere disbelief and genuine anguish upon learning that this institution (in their minds invincible) will cease to exist. This testimony to our combined efforts, yours and ours, we take to heart and share with you. We will miss our unique universe. We are thankful to have had the rare opportunity to know so many good and talented people from many nations and to have lived and worked in the world of books. And so Brentano's, which once spanned two continents, is just a memory now. Seven Roads' Gallery of Book Trade Labels: An immense online collection of labels, which can be searched alphabetically, geographically, and topically. Look under "B" for a collection of different Brentano's labels. I love this site. "The Art of Vintage Booksellers' Labels", a 2009 blog entry by Stephen J. Gertz. "Bookseller's Labels -- A Vanished Custom" on the ReadInk website. 1. It's a shame, too. The travel-guide content inside -- including about a dozen detailed fold-out maps -- is intact and in acceptable shape. But the binding is completely pulled off the spine and is only attached by about one inch of material. Still, if anyone is interested in this book for its content, email me. 3. And we know how well that's been going lately. For background, see The New York Times' "Borders’ Bankruptcy Shakes Industry" and Crain's "Borders goes bankrupt, ending 3 NYC stores". You can also browse over 1300 book trade labels at the Seven Roads Flickr group-- feel free to add your own!